Thursday, April 2, 2015 - 08:32 By Calvin E. Johnson Jr. 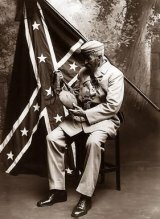 The Georgia General Assembly in 2009 officially and permanently designated the month of April as Confederate History and Heritage Month of every year. April, Confederate History and Heritage Month, is significant as it is the month the War Between the States began (1861) and ended (1865)., and The Great Locomotive Chase, where Union spies attempted to steal the Confederate Locomotive "The General" and destroy rail lines and bridges, took place on April 12, 1862. Why do some schools ignore the teaching of American history? Boys and girls once learned about American soldiers who for over 200 years marched off to war. The young people read about: George Washington, Robert E. Lee and Booker T. Washington. Northern and Southern children stood up proudly to sing patriotic songs from a standard song book that included "Dixie." After the end of the War Between the States, Northern and Southern women formed memorial organizations. They made sure all soldiers were given a Christian burial and a marked grave. Memorial Days were begun in many states North and South of the famous Mason-Dixon Line. Great monuments were also erected that still cast a giant shadow over many town squares and soldiers' cemeteries across the U.S.A.
April 26, has become to be recognized as Confederate Memorial Day in many states. For over one hundred years the Ladies' Memorial Association, United Daughters of the Confederacy and Sons of Confederate Veterans have held memorial services on or near this day. Efforts to mark Confederate graves, erect monuments and hold memorial services were the idea of Mrs. Charles J. Williams. It is written that she was an educated and kind lady. Her husband served as Colonel of the 1st Georgia Regiment during the war. He died of disease in 1862, and was buried in his home town of Columbus, Georgia. On a visit to the graves of her husband and daughter, Mrs. Williams looked at the unkempt soldiers' graves and remembered her daughter as she cleaned the graves and what the little girl had said. She knew what had to do. Mrs. Williams wrote a letter that was published in Southern newspapers asking the women of the South for their help. She asked that memorial organizations be established to take care of the thousands of Confederate graves from the Potomac River to the Rio Grande. She also asked the state legislatures to set aside a day in April to remember the men who wore the gray. With her leadership April 26 was officially adopted in many states. She died in 1874, but not before her native state of Georgia adopted it as a legal holiday. It is still officially recognized in Georgia today. Mrs. Williams was given a full military funeral by the people of Columbus, Georgia and flowers covered her grave. For many years a yearly memorial was conducted at her grave following the soldiers' memorial.